3 Bedroom Villas with private pools air conditioning and WiFi. *Found a cheaper price for the Finesse Villas on the same date?. Call or email us and we will price match on Finesse Villas in Son Bou. 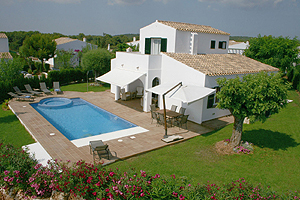 One of Menorca's top villa developments finished with top quality materials and furnishings, original paintings, air conditioning, heating, ample terraces, private pool, plus 24 hour in resort maintenance staff. 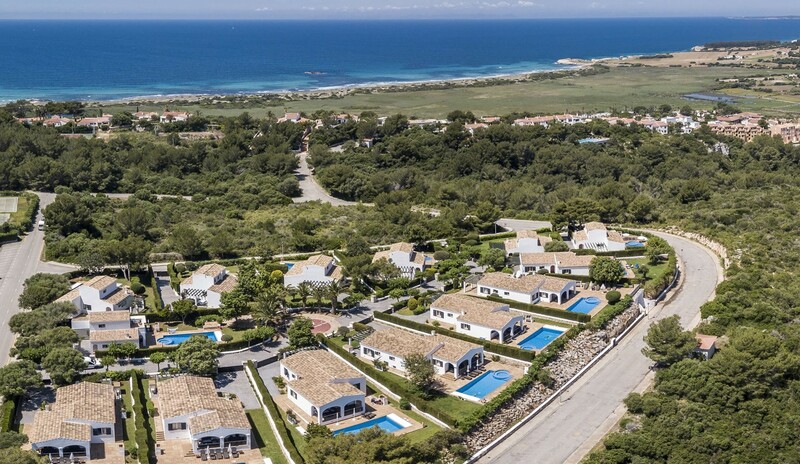 Within this private development, approached by electronic security gates there are fourteen villas with colourful gardens consisting of plants and shrubs natural to Menorca. A central water fountain compliments this pleasant and unique development. Villa numbers 1 to 7 are Type 1 bungalows. has a full compliment of crockery, cutlery and glassware. The comfortable lounge has a discreet cupboard storing the TV (satellite), DVD with a JVC music centre. The arched covered terraces are north facing for shade and the sunny poolside terracing is surround by manicured lawns with views to the surrounding countryside. Elegant cane terrace and sunbathing furniture is provided together with portable quality barbecue and summer dining area. The pools have jacuzzi end plus exterior shower and wash area. Private remote control gates provide access to the driveway and private parking. Finesse Villas numbers 8 to 14 are are Type 2 and built and furnished to the same specification as described above, with the exception that the master "Mediterranean suite" is located on the first floor and has a private balcony. These villas have a south facing orientation and enjoy either sea or partial sea views or country views. 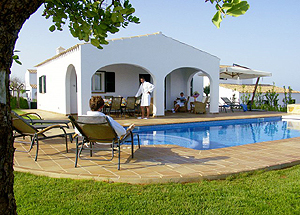 Villa numbers 8, 12 and 13 have there own independent and private access.